Pakistan came into being 1947 after many sacrifices. After Independence of Pakistan, Pakistan has been governed the Govt of India Act 1935. Constitutional history of Pakistan is very unfortunate. However, first constitutional Assembly has been introduced Constitution of 1956 after long debates. 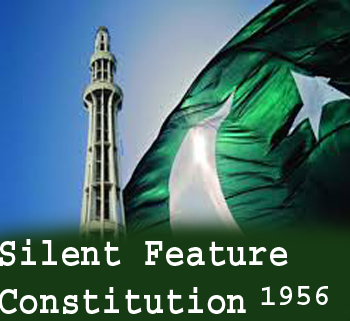 Constitution of 1956 was enforced 23 March 1956. But unfortunately it was abrogated after two years. Constitution of was a written and lengthy document. It had 234 Articles and 6 Schedules. The Constitution of 1956 was partly rigid and Party flexible. The method of Amendment was not difficult. Objective Resolution was included as Preamble of Constitution of 1956. Constitution of 1956 declared Pakistan as Islamic Republic of Pakistan. Under constitution of 1956, Urdu and Bengali were made national Language. Islam was the state religion of Pakistan. Many Islamic Provisions was introduced in constitution of 1956 and decided that no law will be made which against the injunction of Islam. Fundamental Rights were given to the people of Pakistan according to constitution of 1956. Rights of minorities were provided in the constitution of Pakistan 1956. Minorities freely perform own religion festivals. Constitution of 1956 was provided uni-cameral legislature which was based on just national assembly. Federal system was introduced in the country under the constitution of 1956. Constitution of 1956 was introduced parliamentary form of Govt. Freedom of Judiciary was introduced in constitution of 1956. It was decided that supreme court would interpret the constitution. In the Constitution of 1956 method of direct election was introduced. There was only single citizenship in the constitution of 1956. The constitution laid down certain Directive principles of State policy for the Guidance of the Government. They would serve simply as ideals which the state should strive to achieve. The constitution of 1956 was a lengthy one. The reason for its being lengthy was that the framer not only framed the fundamental principles but administrative details were also given. To conclude, it can be stated that constitution history of Pakistan reveals that there has been political conflict between head of state and head of government, and such political conflict has often led the country to political anarchy. And Constitution of Pakistan have been either abrogated or suspended in such political anarchy. As far as constitution of 1956 was concerned, it consisted of some positive characteristics, but such political anarchy caused its abrogation.